Countries across the globe have implemented and have been successfully using National ID numbers for decades now to link all local activities. 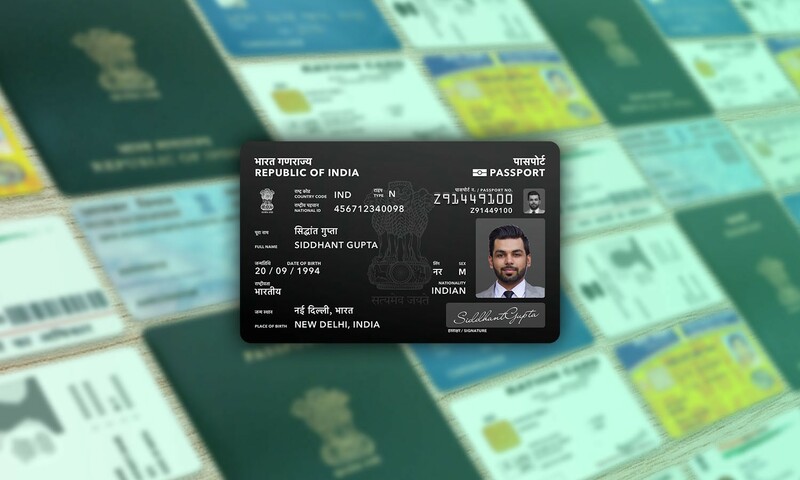 Normally, a National ID card is issued by the country to each citizen. Countries of European Union (EU) and Gulf Cooperation Council (GCC) recognizes each other respectively and allow free movement with passport, but it doesn’t stand true among rest of the world. There are couple of implementations of passport card (in USA and Ireland) but they are very limited. We can merge the National ID card to the Passport and create an unique ID for every citizen which works both inside and outside the county. I tackled all queries while designing the card. While designing, I researched many passports, the requirements, the guidelines, the design and the technology. Mostly impressed with what I witnessed, I went on creating designs which could serve as base model to all countries. at United Spaces Stockholm. In this blogpost, I want to share my experience and my learnings from this event, due to the high importance of this topic. The well-known Swedish company IKEA is one of the most popular furniture and design shops in the world. I am a big fan of IKEA furniture and love to stroll through IKEA shops to get inspired by design options. Another reason to buy IKEA stuff is the appropriate prize. I never thought about where the products come from and therefore I was totally surprised when I heard that IKEA is working on expanding their production for handicraft products made by women organizations. The blue cushion cover above belongs to the project “Tilltalande made in Jordan”, which should be launched 2018 in Sweden. By 2020, IKEA is committed to create 400 new jobs for refugees and women in Jordan to fight against property and empower women in this challenging areas. The concept behind this is social entrepreneurship by working towards a social mission. The central criterion is mission-related impact rather than wealth creation. IKEA established a team, which is working on this by finding new partnerships and sustainable development goals. IKEA want to increase their work with small social entrepreneurs, which have normally no chance to become one of IKEAs’ suppliers and to add them to their value chain. Through the creation of decent jobs, IKEA can fight against poverty and focus on people and the planet. The longterm goal is to provide the social entrepreneurs with a market place and not making them dependent. They started by pointing out social needs: many women at home and no infrastructure. As a result, they introduced different village centers and brought the work home to the women. To support women is one of the utmost importance for IKEA. IKEA and Jordan River Foundation create livelihoods for locals and refugees in Jordan: https://www.youtube.com/watch?v=8SwgvHKBd4Q&t=66s&index=27&list=PLZKweYqjSlQTkErqhhbCtjWzcxSaE2mz3. In this area – social entrepreneurship – innovation comes from small insights and can lead to powerful changes, through sharing a social mission goal. Innovation does not mean to come up with something new, but it should create value. IKEA already started to expand this and already built 19 partnerships. However, they do not have the solution for every part. Therefore, they are looking for commitment and are open for ideas. It is about how can I or/and my company contribute to the growth of social economy and give long-term opportunities. It is an important issue and the approach of social entrepreneurship can lead us to a better world. Thank you Mrs. Gunnarsson for sharing this inspiring work and insights with others to co-create change. #ME1033 Open and User Innovation at KTH! I wanted to share with you a new product that was created by a startup and that i tested last week. It is an app called “KARMA” available on GooglePlay and AppleStore. It is a digital platform for reducing food waste.Instead of throwing away food, Karma offers restaurants and grocery stores to sell their soon-to-be expiring food at discounted prices. You can buy food directly through the app and receives high quality food for less. Therefore, everybody wins and for us as students, it is a good opportunity to make some savings and at the same time get nice food from restaurants and cafes. There is more than 400 registered restaurants, grocery stores, bakeries and cafes. It is all about timing and also geographic proximity.There is a map so it is easy to find food near you, or near the place where you’re going to. You can find various type of food : meals,sweets,bread. Sometimes the price can be half of the original price or even less, so don’t miss this kind of opportunity. For your information, you can pay directly on the app. Also, you can follow your favorite places and get notified when there is food you can rescue. You have your own profile where you can see how much food you saved in total and how much C02 emissions you reduced. I believe their idea is great since thay have managed to create a simple and innovative solution on one of the biggest environmental problems in the world which is food waste. I am very sensitive to this subjet since i am studying sustainable energy and environment and i have done many research on this subject. Globally we waste 1.3 bn tonnes of food every year of a value of 750 billion USD. In Sweden alone we throw away 500,000 tonnes of food per year. If you need more information, don’t hesitate to comment or contact me. And keep in mind that no one can do everything, but together we can do a lot. Imagine an entrepreneurial community shared by Sweden and China! Entrepreneurial events are just expanding in size and quantity. This make me at least to search for unique events which have something new to offer. This search means that I have to try most of the events at least one time and connect with people to learn about more events which are happening. In this process I met a student from Uppsala who was so passionate about China and what he had in mind was to connect China and Sweden when it comes to entrepreneurship and startups. He started from Uppsala but it didn’t take him long to understand that Uppsala is too small and unknown for such international project. At the moment he has launched his Forum, Sweden China startup Forum, in Stockholm and Beijing and I had the honor to be invited for the launch event in Stockholm. I believe that the idea is amazing considering how big the market in China is and the entrepreneurial potential in Sweden. In the event investors, lawyers and startupers were having speeches about how the market is and mentioning the potentials and challenges. It was great environment with a fantastic diversity. Their next event will be in spring and I would strongly recommend it to all of you who are interested in new opportunities! This Monday I was invited to a mingling event at the head office of Northvolt, via the female engineer network Malvina on KTH. Northvolt is a start-up within the energy sector, aiming to build Europe’s largest lithium-ion battery factory. The founders of Northvolt have their backgrounds in Tesla, and working there they got the idea to start a company for large-scale manufacturing of lithium-ion batteries in Sweden. There is no battery factory like this in Sweden today but with our well-developed industries and low energy prices, it is a very good country for this. The thing that I found very interesting with Northvolt is how this startup is determined to grow into a fullscale manufacturing company within the coming five years. Northvolt focuses a lot on product development of their batteries, but they do not really innovate anything new. What they do know is that the future demand for lithium-ion batteries will be huge, as our society will use more renewable energy, electric cars and home storage systems for energy. They know there will be a market for these batteries, and now they rush through the start-up phase in order to start their production on time to meet this growing demand. In some way, it reminds me of the simulation game that we have been playing in this course. Their strategy is to offer the greenest batteries on the market since they predict that a competitive advantage in for example the electric car sector will be to offer products with a low lifecycle CO2 emission. They will do this by keeping most parts of their supply chain in Sweden, where they can have full control on their emissions and ethical standards. I was super inspired by this event and I felt like joining this type of company would be a great way to be an intrapreneur, since none of the employees at Northvolt follows an established “know-how” at the moment – they all get to discover how they shall work to contribute to the success of Northvolt. In the entrance of the office, there were pictures of the future factories of Northvolt. Having this very clear goal visualized on the wall felt inspiring, and I noticed that all employees were proud of the company they are developing together! Wish you all a good day! A while back, in September, I got the chance to attend STHLM TECH FEST with the help of KTH Innovation. I thought I would share my experiences of this event with you. This was my very first time attending STHLM TECH FEST. The first day I was there, on Monday the 4th of September, I got to witness a panel discussion with the co-founder of Klarna, Sebastian Siemiatkowski, the head of Nordics and Baltics of MasterCard, Sasha Krstic, the co-founder of iZettle, Jacob De Geer, and the CEO of Bambora, Johan Tjärnberg. They spoke about the future of the world of fintech and of the difficulties that lie ahead. After that there was a city pitch held about the opportunities for Swedish startups and companies to open up offices in Poland. The person giving the pitch was trying to convince Swedish companies such as Truecaller and Klarna into setting up offices in Krakow and Warszawa. It was good to see how a pitch might be done in real life with the pressure of having a room filled with people criticizing your idea. After attending a couple of these panel discussions and pitches I made sure to check out the fair. There I had the chance to speak to a couple of company representatives from the start-up that some of you might have heard of, Stilla. What they are offering is a product called Stilla Motion that you put on any of your belongings that you would like to protect from being stolen and such, wether it is your backpack or wallet. This device connects to your mobile device through the Stilla app and an alarm goes off on your smartphone when your belongings are being moved. What I think is a really interesting feature is the fact that, in the app, you can adjust how sensitive the movement sensor in the Stilla Motion device is and it also has many more adjustable settings. If you want to know more about Stilla visit: https://wearestilla.com. Lastly, I would just like to comment on the fact that KTH Innovation has been able to do a great thing by providing free tickets to KTH students who want to attend the STHLM TECH FEST. As one of our guest lecturers, Tobias, mentioned previously in his presentation to the class, it is very important that we create platforms and meeting places where different people can meet and interact, because we want to be able to take advantage of the synergies that arises when this happens. I would hope that in the future more students get the chance to attend STHLM TECH FEST and similar events. In november I will also be attending the STHLM TECH MEETUP, so I am really looking forward to that. During this course we have talked about the importance of mentors and learning from others mistakes in order to avoid making the same mistakes and by doing so save for example time and money. Getting a real mentor is one option but there are also a lot of resources on the web that could work as a good supplement. A while ago Timmy Rosendal wrote about a podcast app from a Swedish startup called Acast (http://intopreneur.com/?p=4462). This made me think of a podcast I have listen to and think is interesting. It is called Entrepreneur On Fire https://www.eofire.com/podcast/. Since we are going to create a video about our venture idea it could be interesting to see how other people try to sell their ideas. Here is Entrepreneur On Fire’s video. Do you have any podcasts you would like to recommend? I am writing about this topic since i am currently looking for an internship for the next spring and i was thinking it can be useful for you and your friends to know how to let rectruiters know on Linkedin that you are open to new job opportunities. One basic way to let recruiters know that you are open to new opportunities is through the “Headline” section of your LinkedIn profile. This section is usually reserved for your professional headline, but you can also use this section to notify employers that you are looking for work. You can specify the field you want to work in, the position you are looking , the length if it is an internship for example and also the region you are searching in. But what i think is the most effective way to find a job opportunity is the new setting that LinkedIn recently introduced within their Jobs section that allows you to convey your interest in new job opportunities to recruiters on LinkedIn. You can navigate to this setting by clicking on Jobs > Update Preferences > Scroll down to: Let Recruiters Know You Are Open. You can specify the types of companies and roles you are most interested in. By setting this option on, you are potentially opening your profile to more views by Recruiters. This is also a good feature because it can be used by people who are already working in a compaNy but want to find new opportunities without worrying about their employer finding out. Add a profile picture that aligns with your role as a professional (professional clothing). It has to be good quality and includes you only. Share your current position, current school and also list all your relevant previous experiences. Write a small summary about each experience to let recruiters know what you did,and what skills you got from it. Also, try to optimize your headline, summary, and experiences with relevant keywords. Ask former employers or coworkers to post a comment about you on your profile. Write An engaging summary containing your email address. Use this summary to talk about your next challenges,your dreams and show your motivation to work in a particular field. You can also use this section to clarify your work history, if your careerpath has not been linear. Develop a strong network on Linkedin : over 300/400 you start to be open to networking, and start to be visible. With all these tips, i hope you will find the job of your dreams. One of my key interests is self-development, so, I often self-reflect and read books that helps me along, whether that be biographies or just key insights of successful people. Since, I see myself as a future entre- or intrapreneur I signed up to take the course Entrepreneurship. Consequently, I thought it be fitting to read some books on entrepreneurship. One of these books that I recently finished is Zero to One – Notes on startups, or how to build the future by Peter Thiel. If you’re not completely unfamiliar with entrepreneurship and the tech scene you’ve probably heard of Peter Thiel, the hugely successful serial entrepreneur and one of the founding fathers of one of the world’s most successful startups, PayPal. In the book he shares his top tips on how to create a successful business and cover topics ranging from ideation to distribution. He highlights the importance to innovate, not just copying what others have done and making horizontal progress, or going 1 to n, but rather coming up with something new and making vertical progress, or how he likes to put it – going from 0 to 1. In a few coming posts I will share some of the takeaways from the book. Nevertheless, I would still recommend anyone even slightly interested in entrepreneurship or business to read it. Until the next post, think about the question Peter Thiel always like to ask people he interview for a job, “What important truth do very few people agree with you on?”. Make sure that you express what you can give your customers in terms of creating value for them. And always introduce yourself in terms of what value you offer rather than your formal title. An example that was brought up was that the course leader himself says that his job is “to help people start companies”, rather than saying that he is a business advisor. This should be a top priority in your elevator pitch. Start to sell via your network. Make sure that all your connections know that you have started a new project/business and see if anyone knows someone that would be interested in what you offer. Start-up Stockholm arranges a variety of lectures and also offers one-on-one counselling for start-ups. I did not take any picture since it was such a small class.